Portable digital imaging is now within your reach! 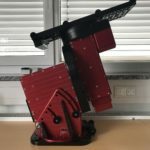 The Paramount MYT (pronounced "mighty") Robotic Telescope Mount is a German equatorial mount designed from the base up to provide unsurpassed stability and performance for portable, semi-portable, or permanent installations. Other than its smaller stature and lower total payload capacity, the Paramount MYT incorporates essentially every feature found in the higher capacity Paramount ME II and Paramount MX+ models. Every Paramount MYT component is custom machined from 6061 aluminum at Software Bisque's production facility. The precision worms are machined from brass. Brass worms and aluminum gears that have a maximum seven (7) arcsecond peak-to-peak periodic error before periodic error correction. DC servomotors provide fast slew speeds and consistent torque at all slew rates. The default maximum slew rate is 5.4 degrees per second. The gear-reducer and worm-block design of the Paramount MYT are extremely efficient so that little power is lost between the motor and the telescope drive. Though good balance is always recommended, the Paramount MYT has no problem slewing or tracking when several foot-pounds out of balance. You'll spend less time fiddling with the telescope and more time acquiring data. If required, slewing and tracking rates of up to six (6) degrees per second in both right ascension axis and declination can be achieved using an optional, higher amperage power supply. An optional, higher wattage power supply is sold separately that can be used to achieve maximum slew rates of up to ten (10) degrees per second. Slew and tracking rates can be configured with 56-bit precision. The right ascension and declination motors can be rotated at 0 to 4000 revolutions per minute and virtually anywhere in between, providing precise tracking and slewing. This gives you the ability to track on comets, asteroids and even fast- or slow-moving objects such as LEO satellites or any object that moves above or below the sidereal rate. Single-reduced belt-driven worms mean the Paramount MYT has backlash so small it is difficult to measure (typically less than two arcseconds in both axes). Autoguiding calibration is always a snap with this "no-slop" system. Spur gears and other components that may introduce backlash are not used. Please visit the Paramount MX+ web page of Software Bisque for details about the Paramount MyT Robotic Telescope System. If you are interested, please send us an email to kontakt (at) baader-planetarium.com or call us.